Roberta Roller Rabbit Discontinued Prints Sale! Earlier today I posted about Roberta Roller Rabbit, and this evening a got an email about their discontinued prints sale. I checked out the website, and the napkins are down to $5! 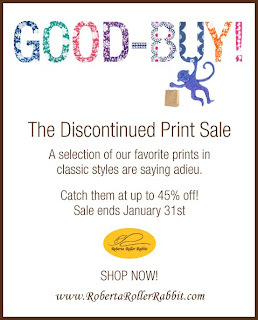 Great deals on some great prints — I have the flavia place mats, very mod, very chic. What a Merry little Christmas gift for yourselves!